Last night, for example, I had a small gathering at my house, and I wanted to curate a playlist for the evening. My house is set up with a Sonos system, which is connected to my iTunes library, as well as Spotify and various other apps. 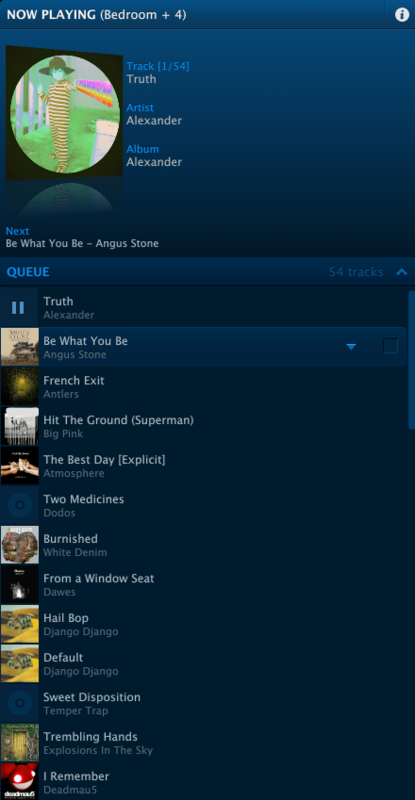 Before I stopped buying music on iTunes (or ripping CDs into iTunes), it was super easy to set a Sonos playlist: I’d just review my iTunes library on Sonos and toss the tunes into a queue to be played. I’d usually chose recent music to play — curating a playlist is a chance to demonstrate your musical taste, after all, and that changes over time. But now that I use Spotify, I realized something rather distressing: I can’t remember the names of most of the bands I’ve listened to over the past couple of years. That made creating a new playlist near impossible — my guests had to endure a musical set that would have felt fresh had the year been 2013. I know Spotify has robust playlist creation tools, and I know I’m supposed to adapt to them, and learn how to create value on the Spotify platform. But the ugly truth is I lean on Spotify’s “Discover” feature, and its attendant algorithms, to suggest all manner of new music for me. I listen to it, but I’ve lost the recall signal which allows me to create a good playlist. For me the most important signal of value is an exchange — I pay the band for their music, the band gives me rights to own and play that music. Streaming has abolished that signal, and I’m feeling rather lost as a result. Perhaps I’ll go back to simply buying music on iTunes, but that feels like going backwards. Streaming is here to stay. However, I’m guessing plenty of folks have run into this issue, and might have a suggestion for how best to address it. So LazyWeb, I ask you: How do you ingest music and give it meaning in a streaming world? How I got around it was to create a playlist called ‘Starred’ where I add any interesting songs I find (or a suggested by the Discover Weekly playlist). Then it’ll be the main list of songs I’ll listen to. I’ll then remove the song when I get sick of it. The other solution I use is to create a ‘Background’ folder to contain background music playlists. I.e work, family, minimal, electronic. Thanks, will give that a go! I create a playlist for the year. Every time I hear a song I really like I add it to that playlist. If it also fits in another playlist I add it there too. So a song can be 2016 and chill. Chill will be built over many years and 2016 only includes songs I’ve heard for the first time this year. Insightful stuff, John. You’re onto some important issues that we here at budtobud have been addressing on our Qus system for some time. You described getting recommendations from friends or trusted sources and then (presumably) joyful interaction after you’ve purchased music. The social component of actually listening to music with friends, in addition to reflecting on and evaluating recommendations from fellow humans – who can correlate moods and experiences far better than “discovery engines” – is harder to come by in a streaming world. The “exchange” you describe as a missing element for establishing value is a very valid concept. Unfortunately, carrying the exchange concept into a streaming world doesn’t really work for all the reasons you mention. In addition, the silos created by music libraries of downloaded or ripped music, premium services like Spotify and Deezer, and the likes or YouTube and SoundCloud exacerbate the “what should I play” problem by adding a “from where should I play it” component. We refer to Qus as the Ultimate Music Player because we’re trying to bring the experience back to the music (not the source) and the people (not the machines). • Within a single app, Qus consolidates browsing, search, play, and playlist creation of popular streaming services with your local music library. This allows the combination of purchased music with streamed services into a single source. A great way to create continuity from the past and the present in playlist creation. • You can listen along with other Qus users — in real time or offline — no matter where they are or what music service they may be using. You can get recommendations from real people. Each person uses their own accounts with Qus brokering the interaction and translating between services on the fly. Qus operates worldwide on iOS, Android, and Kindle.